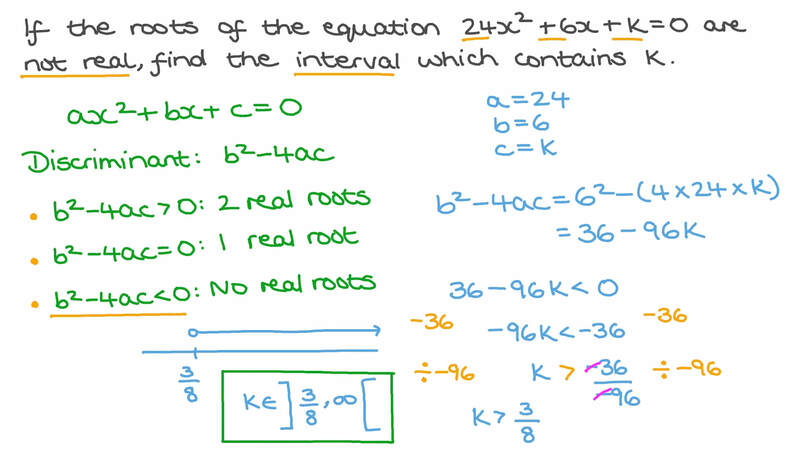 In this lesson, we will learn how to find the discriminant of a quadratic equation and use it to determine the number and type of its roots (solution) without solving it. How many non-real roots will a quadratic equation have if its discriminant is positive? 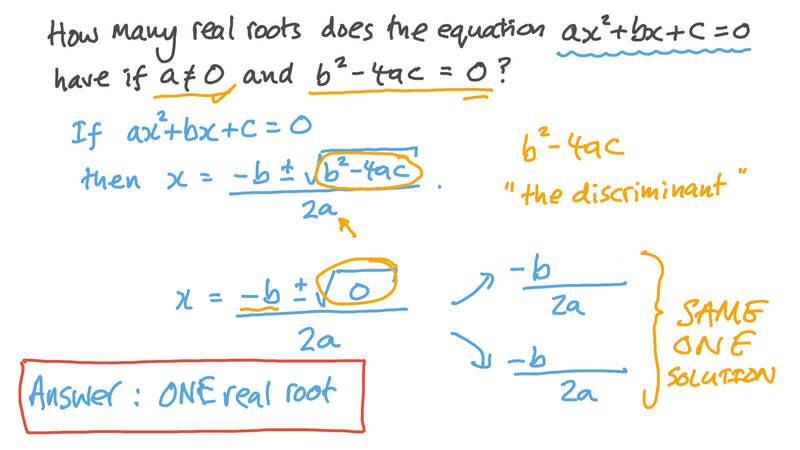 How many non-real roots will a quadratic equation have if its discriminant is negative? Determine the type of the roots of the equation 4 𝑥 ( 𝑥 + 5 ) = − 2 5 . Determine whether the roots of the equation 𝑥 + 𝑥 − 2 = 0 2 are rational or not without solving it. 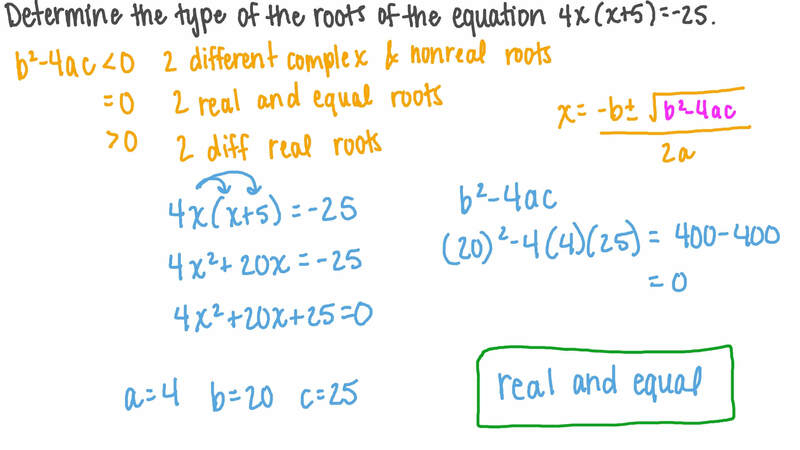 Which is the correct condition for the quadratic equation 𝑎 𝑥 + 𝑏 𝑥 + 𝑐 = 0 2 with real coefficients to have no nonreal roots? A The discriminant 𝑏 − 4 𝑎 𝑐 2 is nonnegative. BThe discriminant 𝑏 − 4 𝑎 𝑐 2 is an integer. C The discriminant 𝑏 − 4 𝑎 𝑐 2 is positive. D The discriminant 𝑏 − 4 𝑎 𝑐 2 is negative. E The discriminant 𝑏 − 4 𝑎 𝑐 2 is equal to zero. The roots of the equation 3 𝑥 − ( 4 𝑚 − 9 ) 𝑥 + 𝑚 − 1 = 0  have different signs. Find the interval in which 𝑚 lies. If the roots of the equation 2 4 𝑥 + 6 𝑥 + 𝑘 = 0 2 are not real, find the interval which contains 𝑘 . How many real roots does the equation 𝑎 𝑥 + 𝑏 𝑥 + 𝑐 = 0 2 have if 𝑎 ≠ 0 and 𝑏 − 4 𝑎 𝑐 = 0 2 ? Determine the type of the roots of the equation ( 𝑥 − 9 ) − 𝑥 ( 𝑥 − 5 ) = 0 . Which of the following describes the roots of the equation ? How many real roots does the following equation have? If the roots of the equation 2 𝑥 + 1 0 𝑥 + 1 2 + 1 𝑘 = 0 2 are equal, what is the value of 𝑘 ? Are the roots of the equation 𝑥 + 6 𝑘 𝑥 + 6 𝑘 = 1 2 rational for all rational values of 𝑘 ? Given that the roots of the equation − 1 8 𝑥 + 3 𝑘 𝑥 − 7 2 = 0  are equal, determine all possible values of 𝑘 . For each value of 𝑘 , work out the roots of the equation. Given that 𝑚 is a real number, and the equation ( 4 𝑚 + 8 ) 𝑥 − 4 𝑚 𝑥 + 𝑚 = 0 2 does not have real roots, find the interval which contains 𝑚 . If the roots of the equation 𝑥 − 8 ( 𝑘 + 1 ) 𝑥 + 6 4 = 0 2 are equal, find the possible values of 𝑘 . If the roots of the equation 4 𝑥 − 𝑘 𝑥 + 1 = 0 2 are equal, what are the possible values of 𝑘 ? Given that the equation 𝑥 − ( − 2 𝑚 + 2 8 ) 𝑥 + 𝑚 = 0 2 2 has no real roots, find the interval that contains 𝑚 . What type of roots does the equation 6 𝑥 + 𝑘 𝑥 + 𝑘 − 1 1 = 0 2 have for all real values of 𝑘 ? Determine the type of the roots of the equation − 2 𝑥 − 6 = 8 𝑥 + 7 . Determine the type of the roots of the equation 𝑥 + 3 6 𝑥 = 1 2 . Does the equation 𝑥 + 2 𝑚 𝑥 + 𝑚 = 9 𝑛 + 8 𝑙 2 2 2 2 have real roots for all real values of 𝑚 , 𝑛 , and 𝑙 ? Suppose the two roots of the equation 𝑥 − ( 𝑘 + 6 ) 𝑥 − ( 1 0 𝑘 − 9 ) = 0  are equal. Determine all possible values of 𝑘 , and then find the two roots. Given that 𝑚 and 𝑛 are rational, non zero numbers, are the roots of the equation − 𝑚 𝑥 − 3  𝑚 − 𝑛  𝑥 + 9 𝑚 𝑛 = 0 2 2 2 2 always rational? If the roots of the equation 𝑥 − 𝑘 𝑥 − 4 𝑘 − 4 𝑥 + 4 = 0 2 are equal, what are the possible values of 𝑘 ? For each value of 𝑘 , work out the roots of the equation.